I have 3 sheets that dont show in dashboard, but they're related to actions in my dashboard. 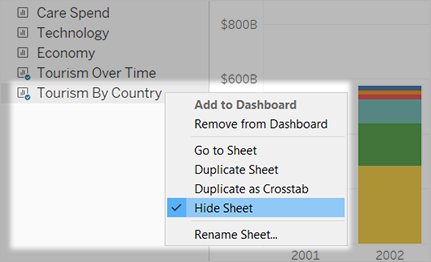 When i publish to tableau server, i want to hide all that sheets. What is the purpose of these sheets if they aren't on a dashboard? You can hide the worksheets by right-clicking the worksheet tab and selecting 'Hide Sheet'. Or, you can choose the sheet name display on the left-hand side of the dashboard and right-click and select 'Hide Sheet' (shown below). Any sheet used for actions & not in dashboard can be hided, but then the action will not work. Hence you have to show those sheets which you have used for actions & are not in dashboard.